A question we often receive from readers is why the Value Bet Detector requires 10 years’ head-to-head (H2H) data and why it is optimised to address matches where there has been a minimum of six H2H meetings in this time frame. This requirement does seem to divide opinions, and our betting friends find it difficult to see that results of games from the past 10 years have any significance at all when predicting the outcome of the next game. Categorically speaking, their thoughts are not entirely wrong – A game that was played, for example, six years ago, cannot have any real influence on the result of an upcoming game. However, that’s not the point when determining betting odds and identifying value! Betting success is not about predicting a result of any forthcoming game with any great certainty; it is about calculating probabilities and distributions, and then getting the right prices for bets. The sports bettor always needs to know the answer for one question, whether the offered market price [odds] for the bet holds value, or not. Sure, a 54% chance never means guaranteed victory, but in comparison, Aberdeen’s chance of winning was calculated at just 26%. 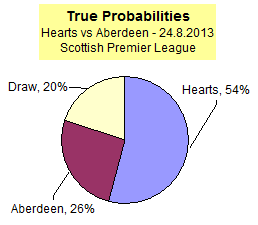 It was immediately apparent that Hearts had more than twice the statistical likelihood of winning than Aberdeen. However, these statistical calculations contradicted the emotional expectations of the public. The sports press at the time was full of information that Hearts were experiencing financial instability and had lost many good players before the start of the season, whilst Aberdeen were developing more positively and had been celebrating their comeback. In addition, Hearts finished 10th last season [2012-13], two places behind Aberdeen, in a league of only 12 teams. Although none of this information was of any statistical value for determining probabilities and odds, it was of immense importance to the supporters of both clubs, and certainly influenced punters’ betting decisions. Bookmakers Match their Betting Odds to Public Opinion! We now come to the approach of bookmakers… Remember, the primary aim of bookmakers is to balance their books and produce a portfolio that generates profits for them every week. Bookmakers set their odds to ensure betting action on both sides of an event in order to win, regardless of the result. 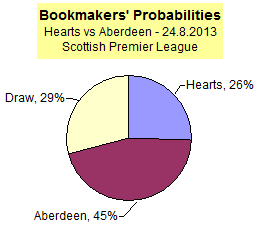 In this example, bookmakers were neither able to offer high odds for Aberdeen to even remotely reflect their low statistical chance of winning; nor could they offer low odds for Hearts, who were not favoured by the public – The sports world, comprised mostly of non-statisticians, would never have understood. Instead of following the true probabilities and offering odds for Hearts in the region of 54% probability (i.e. 1.85), bookmakers chose to offer odds of 3.90, as show in the Value Bet Detector screenshot. For Aberdeen it was exactly the opposite. Instead of the real 26% ‘true’ probability of winning the match (approximately once every four meetings), bookmakers priced their odds at 2.24, representing a 45% chance to win (nearly once every two matches). The game ended in a 2-1 home win for Hearts. If you had looked up the H2H history of these two teams from the last 10 years, you would have noticed that something was amiss with the market odds, because Hearts won 60% of these games against Aberdeen, not just 26%. I hope that it is now a little clearer why the Value Bet Detector for League Games with H2H History factors in the H2H’s between both teams in order to calculate the true odds. On a similar note, there is another article, written some time ago (indeed, it was one of my first articles), where I analysed a weekend of matches in February 2011 and dispelled the conspiracy theories which were used to explain the observed deviation from a fan’s expectations. Are Odds at Betting Exchanges Always Better than with Bookmakers? please analyse for me some daily winning games ive made lots of losses n i need to make some money plz soccer widow contact mi dars ka e-mail n save me d bankruptcy betteing has cozed big up Braham!? Hi Braham, I’m very sorry but we do not provide a pick service, nor do we encourage betting. Successful gambling is not easy. To make serious money from betting is very difficult if not even impossible. In order to avoid bankruptcy, and also the exclusion from society and losing friends, the only thing we can recommend is, stop gambling! i’m new at your site. This article is very interesting. So, basicly you say that bookmaker put their odds according to public opinion. But it is not dangerous for the bookmaker act like this? I have another question, following your bet value detector, the odds for hearts had lots of value. It is like this? Am I undersanting right? yes, you are right. In this example the odds for Hearts were holding a lot of value. However, the bet still only had a chance of 54% of winning which means that every second match with this constellation Hearts wouldn’t have won, but the game may have finished in a draw or Aberdeen victory. Regarding your other question, it’s not dangerous for bookmakers as they are following a set business plan.